NEC DS Phones | E System Sales, Inc.
20 personal speed dials, 12 programmable function keys, built in desk stand, message waiting light, message notification, dual color LED's, last number redial, busy redial, call conference, call transfer, call hold, flash key, microphone mute key, do not disturb, & headset compatible. 20 personal speed dials, 12 programmable function keys, built in desk stand, message waiting light, message notification, dual color LED's, caller ID 2 line LCD display, last number redial, busy redial, call conference, call transfer, call hold, flash key, microphone mute key, do not disturb, & headset compatible. 20 personal speed dials, 24 programmable function keys, built in desk stand, message waiting light, message notification, dual color LED's, caller ID 2 line LCD display, last number redial, busy redial, call conference, call transfer, call hold, flash key, microphone mute key, do not disturb, & headset compatible. 20 personal speed dials, 24 programmable function keys, built in desk stand, message waiting light, message notification, dual color LED's, caller ID 10 line LCD display, last number redial, busy redial, call conference, call transfer, call hold, flash key, microphone mute key, do not disturb, & headset compatible. 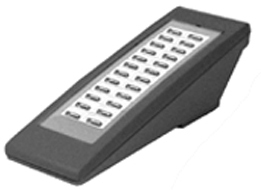 The 110 DSS Console does not require a separate port. Does not require separate power source. Connects to the 34-Button Display speaker phone that will coordinate with it. Gives Busy Lamp Field and one-button access to extensions, trunks, and selected system features.